The sun is just setting and the last rays of direct sunlight catch the top of the Subaru dome. In the distance, high cirrus clouds threaten the prospect of a clear sky later on in the night. As ever, click on the photo for a larger version. Thanks to Brad for discovering this amazing video. For full details see the description by szyzyg on youtube, but essentially asteroids are highlighted white as they are discovered. The red asteroids are earth crossers, the ones we really need to keep an eye on, because this might happen! Even well after the sun has set its light continues to illuminate the sky and clouds. Sometimes it even allows those on Mauna Kea's summit to see clouds hundreds of miles away. 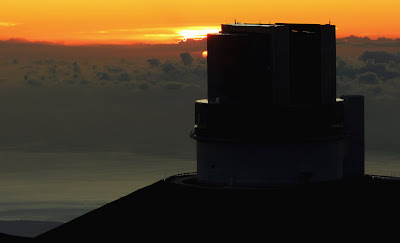 The sun sets below a layer of clouds behind the Subaru Telescope. Taken a few weeks ago and forgotten about! The trade winds were strong enough last week to reach summit level and in fact were much stronger than at sea level. We found ourselves dealing with 30 mph winds with much higher gusts at times. Not only did the winds do their best to turn the telescope into a sail whenever we looked into the east, they created a local turbulence which destroyed any chance of obtaining decent image quality. The shot above, of the setting sun, looks calm enough but I was standing in the lee of UKIRT. Even then the gusty winds made taking a a picture difficult. 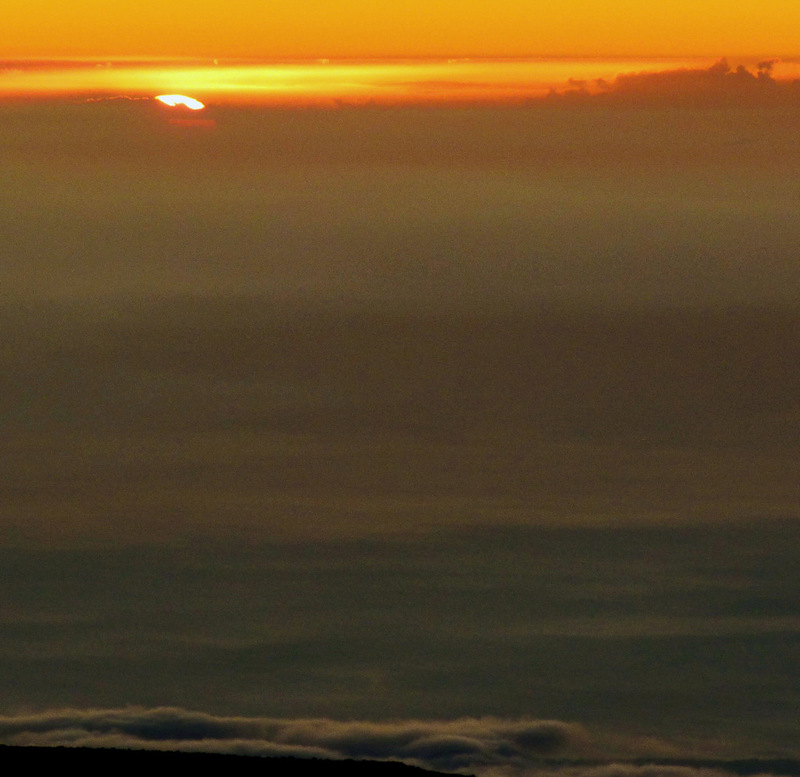 Below, a picture of Hualalai and the clouds in the saddle between Mauna Kea and Mauna Loa taken an hour or so earlier. The winds were even stronger there as they were channeled between the two huge volcanoes and driven upslope. The cloud tops were literally being torn to pieces. I love my Irish music having been raised on it by an Irish father, but this is a little different - and very funny. Don't watch if swearing isn't your thing or you run an airline. Or German if you watch through to the very end. 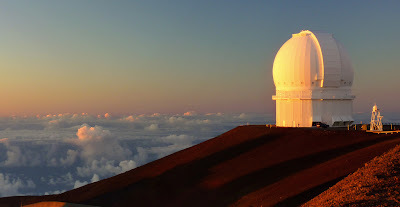 It looks as though NASA's Infrared Telescope Facility (IRTF) on Mauna Kea is closed. In fact it isn't, it's just the dome turning its back to me. The open slit is facing 180 degrees away and the telescope is observing something in the orange twilight sky above the usual sea of clouds. So here's a puzzle. The IRTF spends a lot of time observing planets in our Solar System and there's a good chance it might be doing that. This is around 7:05pm local time on the evening of August 11th - it's looking roughly north-northwest. Anyone hazard a guess as to what the observers were looking at? Not that it'll help, but as ever you can click on the picture for a larger version. Bloody hell, I'm tired. This switching to remote observing mode has to be done to keep us in business but it puts a bit of strain on those of us left. This is another shot from my last scheduled full night at UKIRT but I'm thinking more and more that it really won't be the last - there are just too many issues to deal with. As we've done for 30 years though, we'll make sure UKIRT works and provides the best service of all the professional observatories out there. 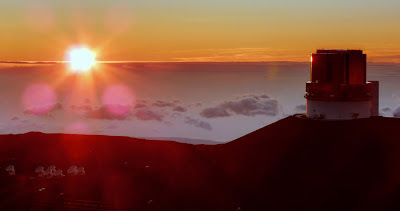 Anyway, it's well after sunset and the twin Kecks are open with Haleakala on Maui in the background. I found some wonderful videos today thanks to British Pathé . Find out about the planet Mars and the possibility of human and animal life on the planet including an in-depth explanation of retrograde motion. Modern technology such as movable arrows are employed to help explain the more succinct points. Gravity is explained in the following video including a demonstration of how the whole of Europe rides on a wave of gravitational distortion. Is that Jack Hawkins playing the role of Newton by the way? Incidentally, this becomes quite surreal half way through. Here's an in-depth and highly scientific report on the validity of astrology. Can someone tell me where I can get a costume and hat like the one "Nostrogeezer" wears? I want one so much. Couldn't help it, I had to get a bit of lens flare on my last official full night at UKIRT. Pictures like this aren't normally ones I post because they show I don't always take care of cleaning my lenses, but the flare pattern is interesting - it looks as though I rolled a six! It was an interesting night. Despite a clear sky, conditions were poor and above all, on the odd occasion I stepped outside to see the Perseid meteors, I think I saw only one in total. With 30 to 40-mph winds and temperatures well below freezing, I didn't stay outside long enough to see if there were any others! Keck 1 at sunset this evening - just over an hour ago. 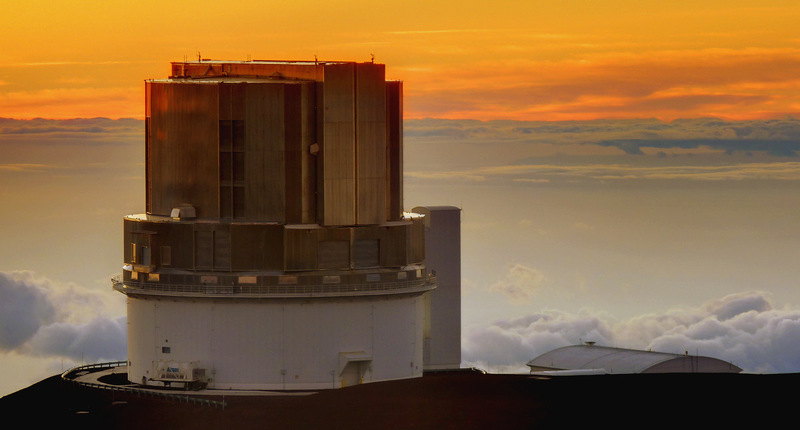 This seems so strange and it's come so quickly, but this is my final officially scheduled full night at the summit of Mauna Kea due to our upcoming switch to remote observing. I'm up again a few times during the rest of this year but all of them are support runs where I'm only at the summit for a few hours in the evening. What an evening as well! Howling winds, below freezing temperatures and dreadful seeing. Oh well, I can't ask for everything I guess. It's going to feel a little sad at the end of the night when we leave for HP although my gut feeling is that I'm going to spending plenty of nights up here in the future. I hope so! Subaru a little earlier at sunset. 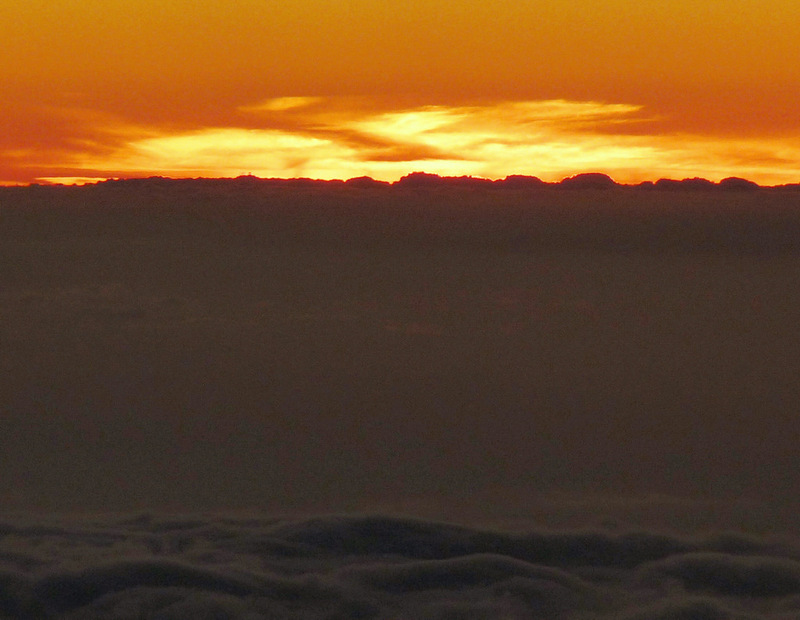 From atop Mauna Kea several inversion layers out to the west over the Pacific Ocean are noticeable due to their effect on the sunset. This evening's sunset was difficult to photograph as the winds were as high as 40mph, so I didn't bother with trying anything too spectacular, but did try and capture the setting sun with short exposures. 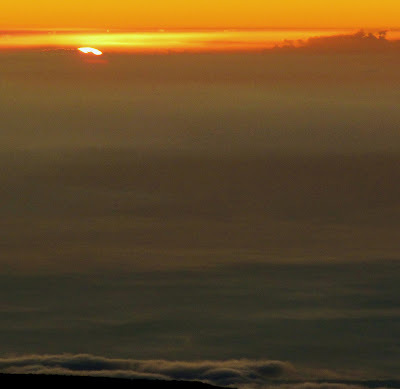 If you look closely (click on the image for a larger version) the upper and separate part of the sun (a mirage) is caused by refraction in a strong inversion layer. The layer holds air of a different temperature than below, hence has a different density therefore a different refractive index (remember your physics lesson at school?). Several weaker inversion layers can also be seen distorting the disk of the sun as it sets behind very distant clouds. Eventually, the mirage disappears as the sun disappears behind the clouds and it's time to start another night on the mountain. Sometime we're so busy at sunset there's little time to take good sunset photographs. You just pop outside, take a couple of hand-held shots and head back inside to deal with whatever's going on. I took this on one of those occasions and it wasn't helped by some high winds. I'd started our observatory calibration sequences and popped outside quickly to watch the sun set before returning to the control room to sort out some problems we were having. I'm not sure about this picture, it's a couple of hand-held pictures stitched together, but I like the colours and the lens flare! Eddie got the limelight yesterday so it's Bubbles' turn with her James Bond stare. She's old as well, about 9-months younger than Eddie, and thinks Eddie is her mum (she isn't). Bubbles and Eddie have an odd relationship. Bubbles will follow Eddie everywhere and Eddie doesn't like that but puts up with it. When they sleep, Bubbles' first task is to cuddle up to Eddie and if Eddie is half awake she runs away, but if she's really tired after her normal routine of pacing around the house and yard all day, she allows Bubbles to cuddle up. That usually lasts ten minutes until Bubbles wants to play with Eddie and then it's the "where did my mum go?" look. Quite often, though, I find them sleeping together when I wake up in the morning. Bubbles is not the most energetic of cats, her favourite pastime is lying by my side (or Eddie's), looking cute and purring like a meat grinder with BP pumping cement into it. Still, without any doubt, she has learned how to attract attention. Unlike Eddie, she likes to pose for the camera. What does Eddie think? Nothing really, just as long as Bubbles doesn't bother her and she can stretch out on top of her favourite cardboard box. 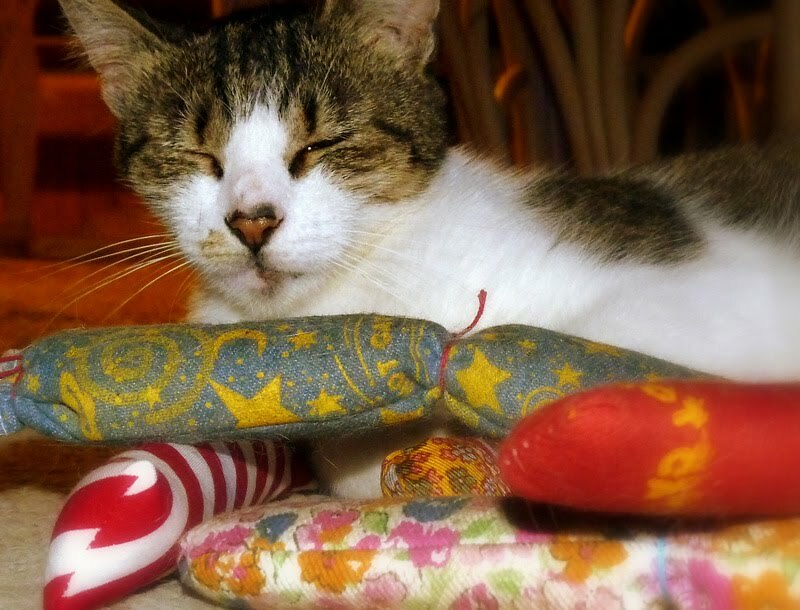 After five minutes of frenetic activity with the catnip-filled toys, Eddie takes a rest. She's been with me from almost the first day I moved to Hawai`i 14 years ago and is (usually) still as active as she was when a kitten and certainly as cheeky. She just doesn't take any nonsense these days, just like the rest of us as we get older I suppose! There are several reasons why Mauna Kea is one of the very best astronomical observing sites on the planet. 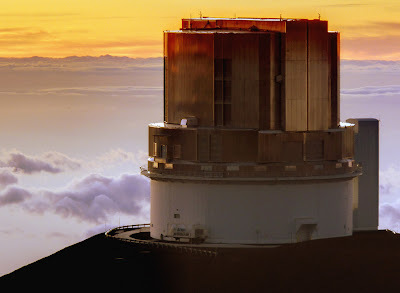 One of them is the inversion layer which is caused by cool air above the summit sinking and preventing the warmer air nearer the surface from rising higher than a few thousand feet. 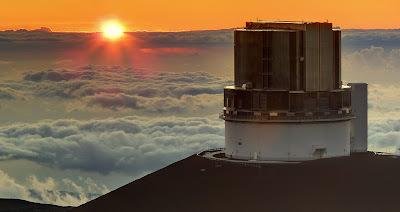 It means the summit is free of cloud and fog for much of the year - weather can be a real problem for observatories closer to sea level. That's not to say we don't get hit by clouds. Depending on how the jet stream is behaving we can get hit by high level cirrus clouds for days on end that don't care about the inversion layer. 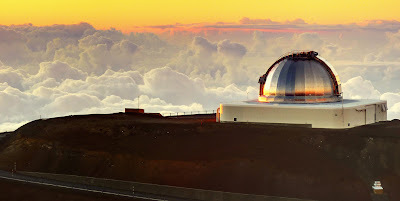 They provide the best sunsets for tourists and photographers but for optical and infrared telescopes they make observing rather tricky. Then there are evenings when there's an inversion layer but convection is strong enough to force the tops of the clouds through the layer as in these pictures. 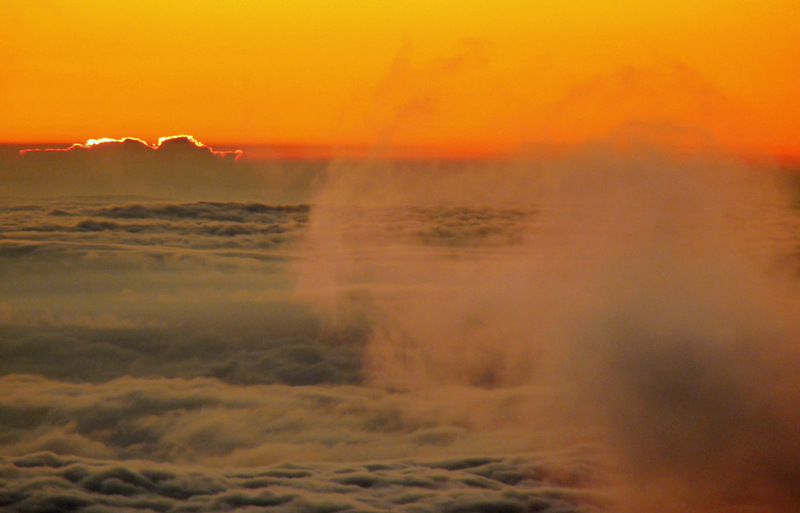 Some of us who've worked at the summit long enough can often predict how good a night we'll have in terms of image quality just by looking at the clouds below us and how far they've risen above the layer. There's even one or two of us who think they can tell how much water is in the atmosphere above us simply by looking at the night sky! Kooks! Except I'm one of them! 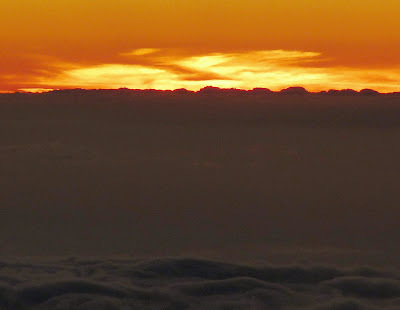 Anyway, here are more clouds to look at from the summit, I hope you enjoy the pictures. 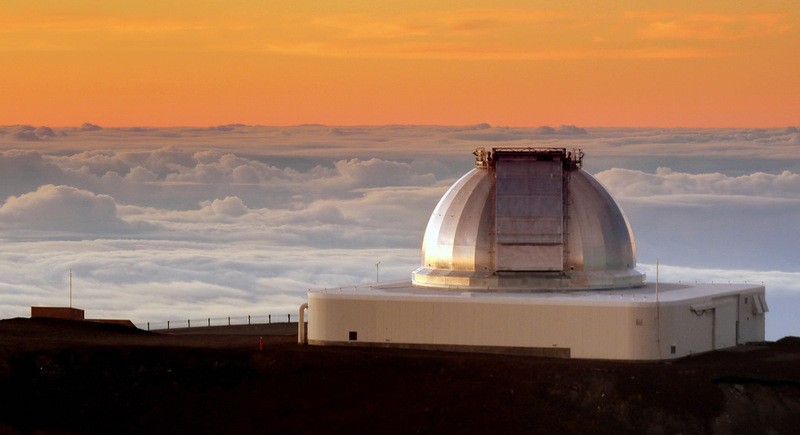 At the top is the NASA IRTF with a very reflective dome and inversion layer busting clouds in the background. The CFHT and one or two convective cumulus clouds to the north. The tops are just high enough to catch the last light from the setting sun. The shadows on the slope below the observatory are caused by the Kecks and Subaru. You can tell where the inversion layer is in the two pictures above. Just look for the flat-topped cloud layers (click on the pictures for a larger version if you want). 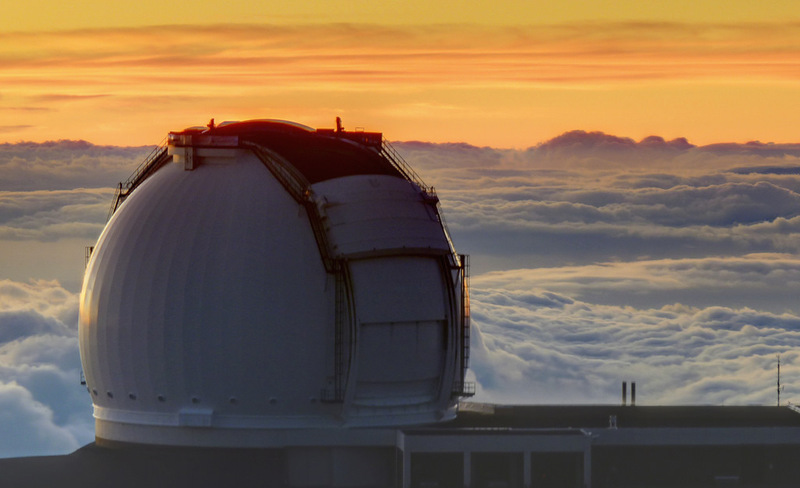 The clouds are really bubbling up between the Big Island and Maui to the North-West. 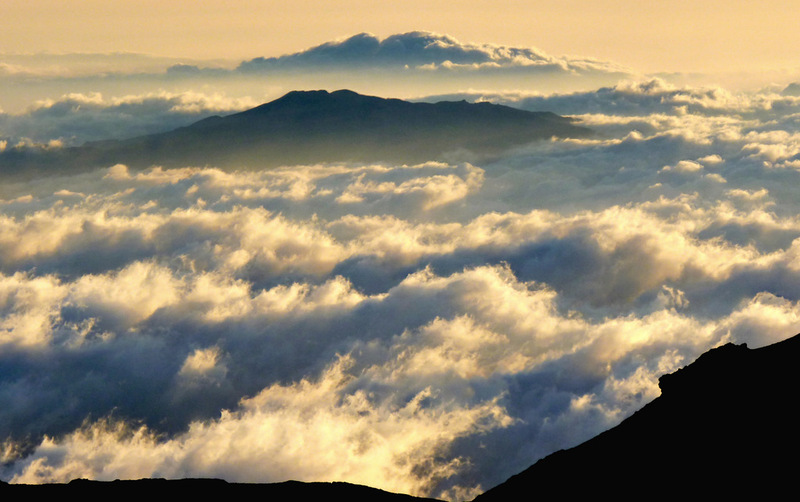 The summit of Haleakala on Maui is visible in the distance. Final walk-around and check before observing starts. It's well after sunset, the Kecks are opening and the clouds down below shouldn't be a problem tonight. Not much to say this evening, it's work all day and night at the moment and I've certainly had a few curve balls thrown my way. If I still lived in England I would have said "googlies sent my way" but no-one in the US would know what I was talking about. Just before I left the UK many years ago I actually managed to learn how to bowl a googly but my master ball was the top-spinner. I seemed to bowl that every time even when I didn't mean to. I think I can cope with the extra work - it keeps the job interesting to say the least - but the lack of cricket is getting me down! In the meantime, just another sunset photo to to keep everyone satisfied. "Highway 11 is closed in both directions at the 87 Mile Marker due to a traffic accident." "Highway 190 is now open in both directions"
As much as I appreciate the time and effort these people put into their work, it's a great example of life on the island. This is a small, isolated place with few highways - it's almost impossible to get lost as a driver. The key to island life though is not to expect competence. If you can live and cope with that then life on the island is much more enjoyable.